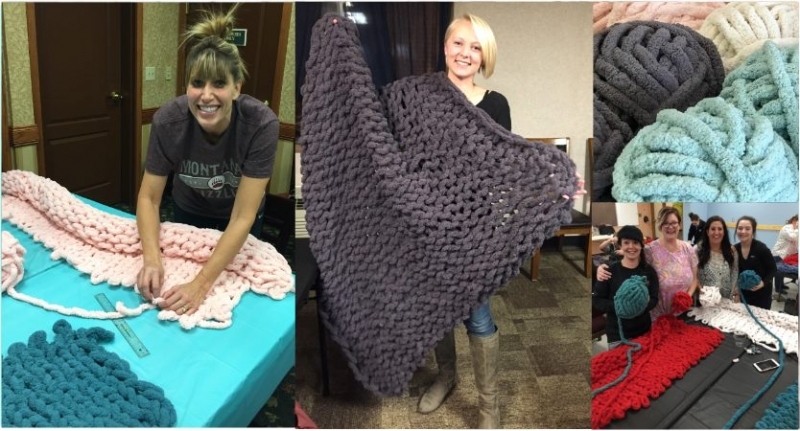 Montana Winter Weather and Jack Frost is nipping at our noses...So, it's the perfect time to join us and create something beautiful to keep you warm and cozy OR to give as a gift! NO knitting experience required. Everything you need to create a one-of-kind, super cozy blanket is provided and we'll guide you step-by-step. $85 Includes everything from start to finish - 140 yards of chunky chenille yarn and materials. Wednesday, April 10th @ 10 p.m. Private Creative Workshops are available---Birthday Parties, Office Parties, Bachelorette Parties, Church Group Parties, Christmas Parties, Bridal Showers, Team Building, Girls' Night Out.